Left to right: Revell Weightman, LMI Group; Jenny MacDonald, Emjay Insurance Brokers; David Cook; Vero Claims; Wendy Reid, Crawford and Co.
As most of you know, I attend a lot of conferences and see a lot of sessions. I particularly enjoyed one I saw yesterday in Adelaide, which was a panel session hosted/chaired by Keith Till from AIMS . A group to top professionals explained to the audience their role in managing a major loss that occurred in Sydney last year. Jenny MacDonald of Emjay Insurance Brokers explained the brokers role; David Cook, Senior Claims Specialist at Suncorp Group, explained Vero as the Underwriter’s role and his in the all important claims function; Wendy Reid from Crawford and Co explained her teams role as the loss adjuster and Revell Weightman, head of LMI Forensic, explained the role of the claims preparer. This was a major loss in the 10’s of millions of dollars and the insured himself spoke via video through LMI Media . It was a great story of a broker who got the program right from the get go, an insured who worked tirelessly to mitigate the loss and claims professionals at Vero, Crawfords and LMI working well together despite not always agreeing. 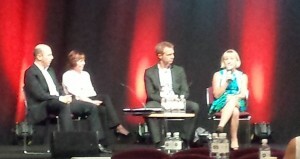 I enjoyed the session as it painted the industry as very professional and working to assist a genuine business recover. Well done to all concerned. It was an informative, thought provoking and entertaining session. Hi Allan – I’d be really interested in seeing a video of the session, if it’s available.